CLEMSON, SC – Clemson Associate Athletic Director for Football Operations Woody McCorvey has been selected for the Atmore, AL Area Hall of Fame. McCorvey is in his ninth year at Clemson, his second year as an associate athletic director under Head Football Coach Dabo Swinney. McCorvey has strong ties to the state of Alabama. Born in Grove Hill, AL on September 30, 1950, McCorvey graduated from Escambia County Training School in 1968 where he lettered in football and basketball. He then earned four varsity letters playing quarterback for Alabama State University. 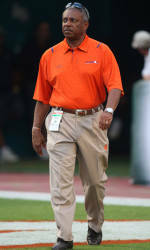 He came to Clemson in 1983 and helped the Tigers to a 60-19-3 record over eight seasons. Clemson posted a 10-2 record in each of his last three seasons and won bowl games each season. Clemson won the ACC championship in 1986-87-88 during his first tenure with the Tigers. McCorvey also worked at the University of Alabama from 1990-97. During that time the Crimson Tied won he 1992 National Championship with a victory over the University of Miami in the 1993 Sugar Bowl. He also worked at the University of South Carolina (1998), the University of Tennessee (1999-04) and at Mississippi State (2004-08). Tennessee was 46-14 in his time in Knoxville and won three straight New Year’s Day Bowl games. McCorvey is married to Ann Brown McCorvey and they have one son, Marlon, who was born in 1970.